A simple recipe for the most tender BBQ Pork Ribs in the oven or the grill. 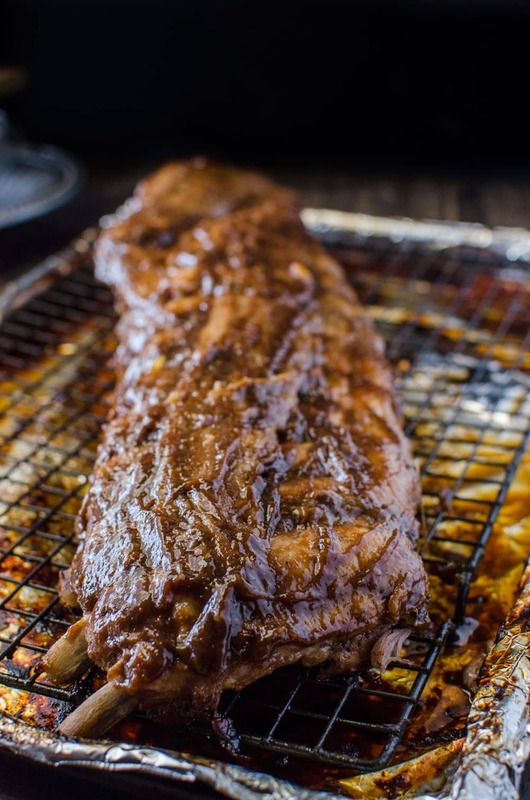 Marinated with a sweet and spicy habanero peach BBQ sauce (made using KC Masterpiece® BBQ Sauce Mix & Dry Rub), these Habanero and Peach BBQ pork ribs can be cooked completely in the oven, or finished off on the grill for a glorious smoky flavour. 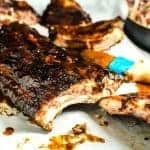 This is a foolproof BBQ Baby back ribs recipe that results in deliciously juicy meat with a rich, dark brown crust on top, that pulls off the bone cleanly. Growing up in New Zealand, my seasons usually went like this – winter, spring, Barbeque, autumn. Grilling outdoors with friends and family in Summer, always guaranteed a good time. And good food, of course. Ribs, shrimp, sausages, chicken and potatoes featured heavily in our BBQ spreads, but the one thing we absolutely couldn’t do without was BBQ sauce – a GOOD BBQ sauce! While I do often make my own BBQ sauce now, I don’t always have the time for that, because apparently as adults, we are not entitled to three months of summer vacation. But fear not my good friends, I’ve got a solution for that. This KC Masterpiece® BBQ Sauce Mix & Dry Rub is a beautiful canvas to develop some fantastic summertime grilling flavours! So even if you’re not a seasoned veteran in the kitchen, this delicious dry rub and sauce mix will guarantee that your grilled meat will be slathered with and drenched in flavour! We know that pork ribs are some of the most satisfying comfort food around. And when cooked properly, pork ribs can be a powerhouse of flavour. The recipe that I have for you guys today combines the best of many worlds for perfectly cooked, convenient and ridiculously tasty peach BBQ pork ribs. These peach BBQ pork ribs can be cooked completely in the oven, for the convenience of those who don’t have access to an outdoor grill. 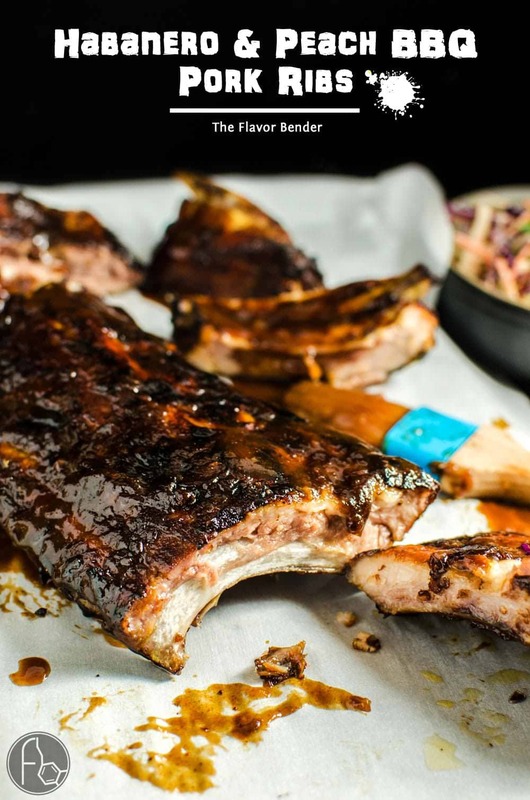 Alternatively, you can cook these peach BBQ pork ribs in the oven and then finish it off on the grill, to get that irresistible smoky flavour. However, if you’d like to get that smoky flavour without the use of a grill, you could use liquid smoke (which I have not used in this recipe, and feel like you don’t really need to). The meat in these peach BBQ pork ribs is absolutely perfectly cooked, juicy and tender, pulls off the bone cleanly, with a rich, dark brown, glistening crust (bark) on top. I made a sweet and spicy BBQ sauce to use as a wet marinade (no dry rub used in this recipe). The flavour of roasted pork is preserved well and is throughout the meat! 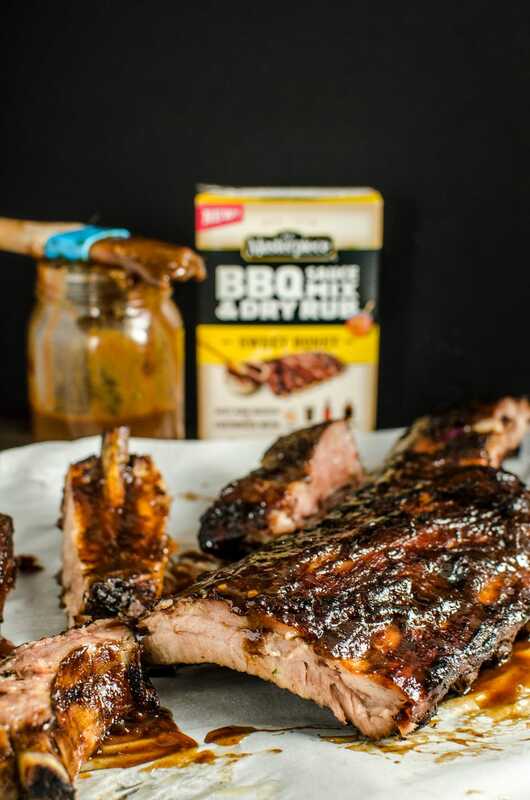 This KC Masterpiece Dry Mix comes in two flavours – Original and Sweet Honey, and it gives you a fantastic mix of BBQ spices and flavours as the base of your BBQ sauce or dry rub. You could either use it as a dry rub on its own, or mix it with a liquid component to make an easy, delicious BBQ sauce. Two 2 oz pouches will make 16 oz of BBQ sauce. You can simply add water or make it taste exactly how you want by adding one or a combination of liquids like juice, beer or bourbon (YUM!). I wanted a potent sweet and spicy combo in these peach BBQ pork ribs, so I used a mix of charred habanero, peaches and lemon juice to make my BBQ sauce and marinade! And it’s so freakin’ good! 🙂 The peaches and lemon juice combine to give a sweet, fruity profile to this habanero peach BBQ sauce that complements the meat flavour in the peach BBQ pork ribs really well. 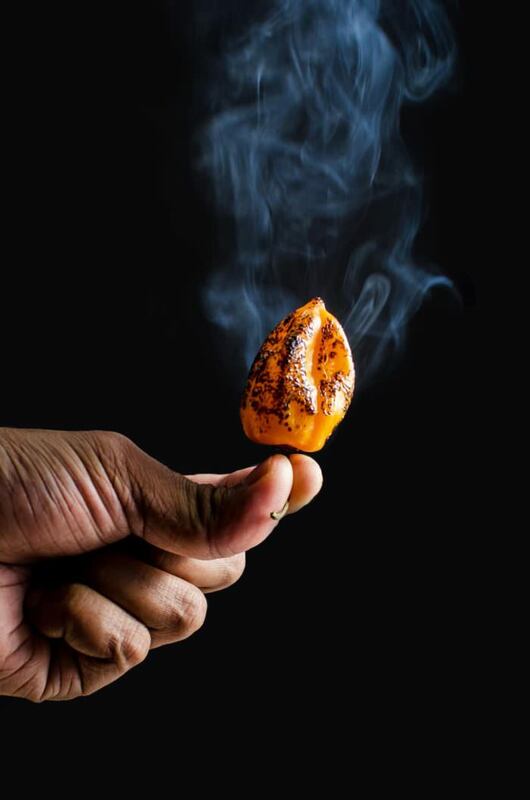 If you’re like us and you love the heat, go for two habaneros. If not, it’s always a good idea to err on the side of caution and use one habanero pepper instead. 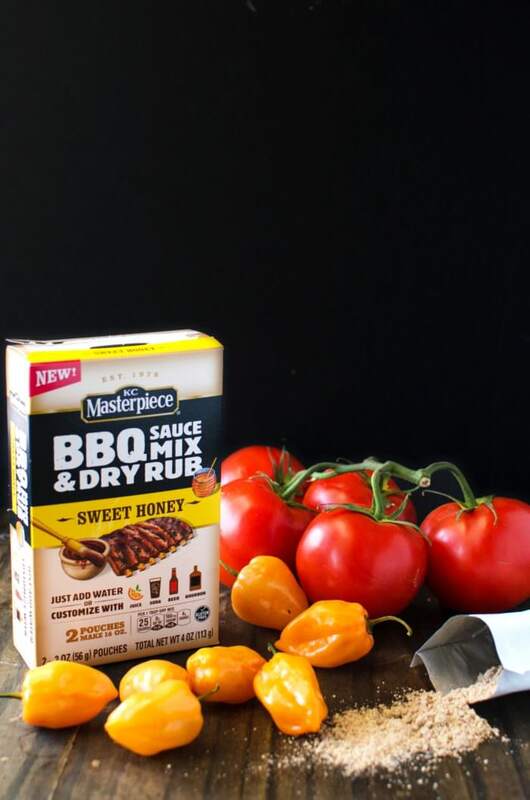 What’s really nifty about this KC Masterpiece Dry Mix is that you can use different liquid mixers to customize the flavour of your BBQ sauce, while still using the same package of sauce mix and dry rub! So go ahead and take out that grill and let your creative juices flow and make your grilled pork, chicken, beef or vegetables taste just the way you want ’em to! So get yourself a rack of baby back ribs. Remove the membrane on the back. Use paper towels to pat try both sides. 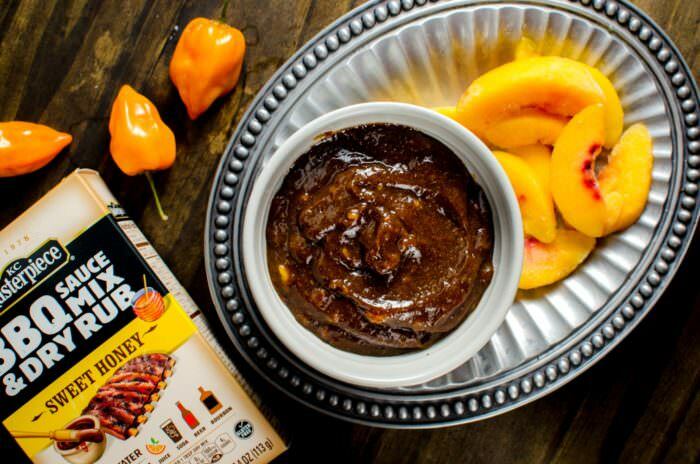 Slather the rack of ribs with the habanero peach BBQ sauce and marinate for a few hours (or preferably overnight). Slow roast in the oven for 2 hours at 300°F. Then grill (or broil) your peach BBQ pork ribs for 20 minutes on high heat. Put your ribs bib on and get ready for that rib smile because you got gloriously flavourful, moist, juicy habanero and peach BBQ pork ribs! 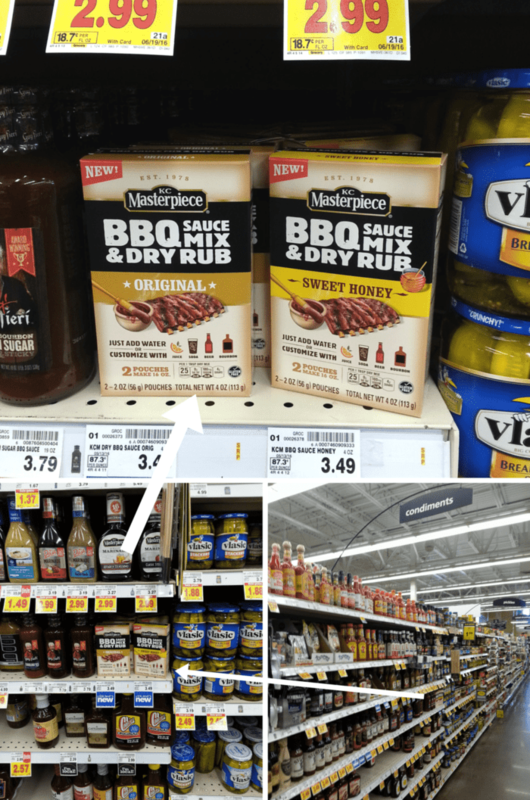 So head on over to your closest Dillons or Kroger Store and get a box of KC Masterpiece® BBQ Sauce Mix & Dry Rub in the condiments aisle. It’s easy to spot because it stands out amongst all the other BBQ sauce bottles. Plus from 6/18 to 8/31 you can get $1.00 off of 1 KC Masterpiece Dry Rub. Check out this offer and many others here! What would YOU add to your BBQ sauce to make it your own?? Optional step - use a blowtorch or the open flame on your gas stove (be very careful!) to char the habanero peppers. Set aside to cool. Then roughly slice the habanero into 2 - 3 slices and remove the seeds. Place the peaches, habanero, honey and lemon in a small blender or processor. Blend until fairly smooth (it’s OK if some peach chunks remain). This should give you about 1 - 1 ½ cups of juice. Place this mix in a saucepan and heat over medium heat until it simmers. Add the contents of both KC Masterpiece® Dry Mix pouches and mix until smooth. Remove from heat. The BBQ sauce will be very thick. Add up to ½ cup of water while mixing, to get a thick, flowing consistency. Season with salt if needed. Divide into two and set aside (I used about ⅓ of this to marinate the ribs and then to brush on before grilling, and the rest to serve with the ribs). The day before - place the rack of baby back ribs on a tray with the bone side facing up. Make a small cut at the edges, to make it easier to remove the thin membrane. Pat it dry using paper towels, on both sides. Generously apply habanero peach BBQ sauce over the ribs, on both sides. Cover with plastic wrap or foil and let it marinate for 3 hours (or up to overnight for best results). Next day - let the pork ribs come to room temperature, while you preheat the oven to 300°F. Place a wire rack on a baking tray and wrap the whole thing with foil. Place the pork ribs on the wire rack. 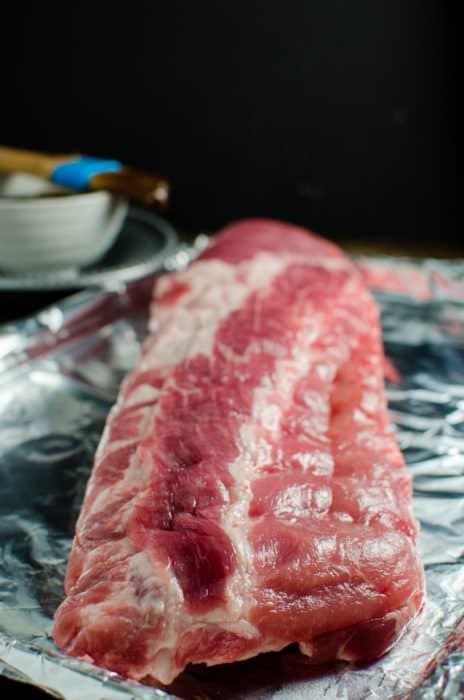 Let the ribs bake in the oven for about 2 hours (or until the pork is juicy, tender, and cooked perfectly). Remove from the oven and let it cool, while covered. At this stage, you can keep it in the fridge till needed (overnight, up to 24 hours) or just let it rest for a few hours - it tastes better and holds its shape better when it has cooled down. Oven method - preheat the oven broiler. 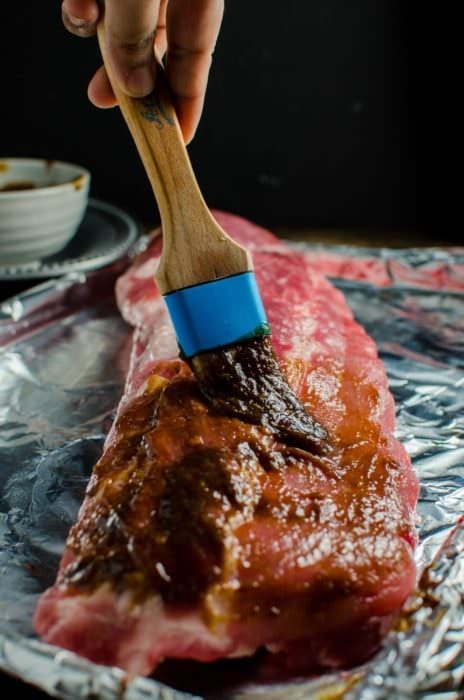 Brush the Pork ribs generously with habanero peach BBQ sauce (on both sides). Broil the pork ribs, uncovered, while on the same wire rack - bone side up, for 5 - 10 minutes, until caramelized. And then another 5 - 10 minutes on the meat side, until caramelized. Grill method - preheat your grill to high heat. 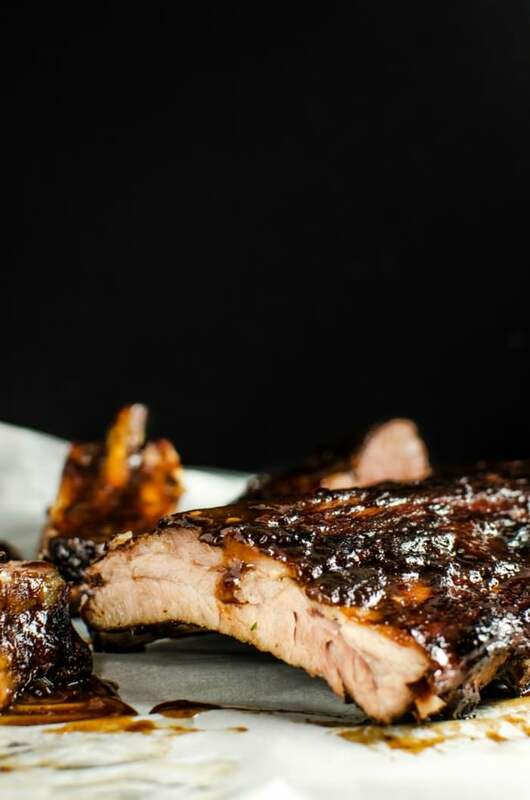 Place the baby back ribs that are generously brushed with the BBQ sauce, on the grill and cook until heated through with charred and caramelized spots, while turning the ribs over frequently, about 10 - 15 minutes. Brush some butter on top (optional) along with some extra BBQ sauce and serve. 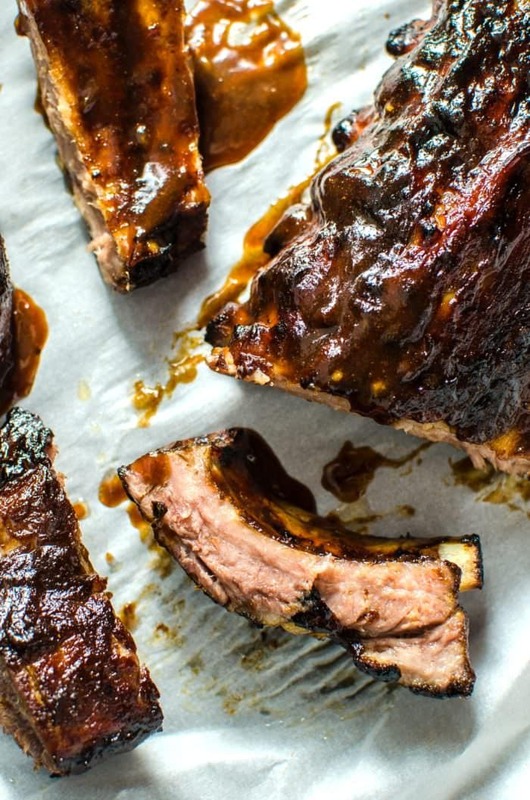 If you liked these peach BBQ pork ribs recipe, don’t forget to subscribe for new (and free) recipes by entering your email address on the side bar (and get all these recipes delivered straight to your inbox), so you don’t miss out on a thing. You can find me on FACEBOOK, TWITTER,INSTAGRAM, PINTEREST, YOU TUBE and GOOGLE-PLUS too. 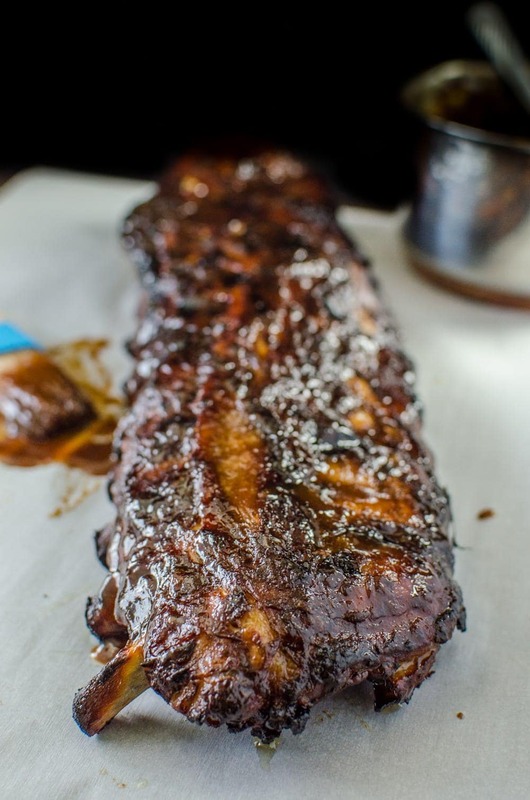 I love that you can make the ribs in the oven so I can have these all year round! Sweet and spicy is the way to go and these will have me licking my fingers clean!